Maasdam as she sails past the Euromast at Rotterdam, at the 18th of july 2006. This was her first visit to her homeport since 1995. The old Holland America Line was taken over by Carnival Corporation in the early days of 1989 and so came an end to the passengerdivision of The Netherlands. Actually, the end was already there in the mid 1970's when the linevoyages were discontinued by all companies flying the Dutch flag. Some companies did survive, but only few still used passengerships. Rotterdamsche Lloyd, VNS, KJCPL, KNSM and de Nederland Lijn became the combined Shipping Union, later Nedlloyd, only for freightservices. Most old passenger-carring companies were part of this Union and they survived as P&O Nedlloyd untill this part of P&O was taken over by Maersk. Their connection with Holland is just their history. The HAL reflagged their ships, first to the Dutch Antilles, so it was still a little bit Dutch, but after that to the Bahamas. Their headoffice moved to Seattle, after some time in a not very obvious place named Stamford, Connecticut. But allthough, the HAL remained a Dutch company untill the takeover by Carnival in 1989. Just before, in the middle of the 1980's after the succesfull introduction of the 'N'-class of ships, Noordam and Nieuw Amsterdam, HAL planned to built several extra ships that would be able to compete with the newer ships of other lines, including Carnival. But then after the Carnival deal was sealed, the new parentcompany cancelled the planned newbuildings and instead a new class of ships was ordered from the Fincantieri yards in Italy, dubbed the 'S' class because it was meant that all ships of the class would be given names starting with the letter 'S'. The names would be Statendam, Stellendam and Schiedam for the new trio. 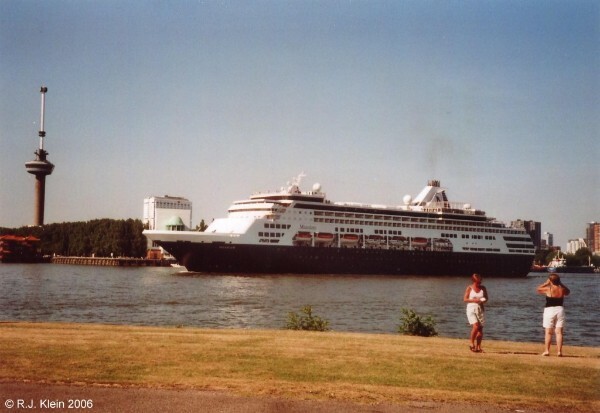 The first ship was launched as Statendam, the fifth time this name was used, at the 3rd of april of 1992 and with a little over 55.000 tons, she was the largest ship in the long history of the Holland America Line. The massive ship was totally different from the past HAL-ships but with these ships HAL was likely to grow into the modern cruise-age. The design was based on the design of Costa Classica and Costa Romantica, both ships sailing for the Italian Costa Crociere, that became also part of the Carnival Corporation a little after Holland America Line did. The largest change between the Statendam-slass and the Costa pair is the design of the hull. At the Holland America liners, the hull is more buoyant as the weight of the superstructure of the dam-ships is higher. Also the rudder-design is different, as the HAL ships have so-called articulated 'Hinze' flap rudders, meaning that a part of the rudder can be moved seperate from the rest to give the ships more maneuverability. With these little changes, the class became known as one of the most state-of-the-art cruiseships in the world. But there were a few concerns about the fact or the new ships would be able to meet the qualifications for the 1990 SOLAS regulations, as those were very high for the time, but when Statendam passed the inspections, so would her sisters. The ships were given a classic Holland America Line inside decor designed by the Dutch company VFD and they also got a traditional darkblue hull instead of the all-white of most modern cruiseliners. When the second ship was completed at the 1st of january 1993, the originally planned naming was changed and there was also a fourth ship added to the class. The new naming was now based on well-known shipnames from the companies history, so the second one became the fifth Maasdam. The theme for her interiours is the old Dutch East India company and the West India Company trought the 17th and 19th centuries. The ship does have a classic feel about her, combining the historic strenght of the old Holland America Line with all modern needs for todays passenger. Especially because ships of the big companies seem to grow in size to monstreous proportions, these Holland America liners are truly of a midsize that everone could like. Not too small but certainly not big as well. And a plus for old-time cruisers, the ship has a wraparound promenade deck made of teak! As said, the ship was built at Fincantieri's Monfalcone yards in Italy as yardnumber 5882. She measured some 55.451 tons and aboard was space for 1258 passengers based on a two-per-cabin measure, but the total number is 1692. The ship has a lenght of 219,21 meters, a width of 30,80 meters and a draft of 7,50 meters. Her passengers can make themselves feel at home on 10 passengerdecks out of a total of 12, just as her 580 crewmembers who sometimes really ARE at home... The ship is powered by five dieselengines designed by Sulzer, propelling her at a speed of around 22 knots across the worlds oceans. Maasdam was named by actress June Allyson, who was born in 1917 and has starred in many films like LittleWomen (1949) and The Glenn Miller Story (1954). Her fame as its peak during the 1940's and 1950's. She also played Broadway shows and had her own televisionshow. June Allyson passed away in 2006, aged 88. Maasdam's first cruise was from Port Everglades to St. Thomas on the 3rd of december 1993. After her, Ryndam and Veendam followed. They were mostly used for Caribbean and Alaskan cruises, because that was the main region for the company since the 1970's. But when more and more ships were added to the growing fleet in the 1990's, Holland America Line became an important player in the industry just about everywhere in the world. They even celebrated this in their Vista-class of ships, named after every region that they are present at this time. Of course these are east, west, north and south. 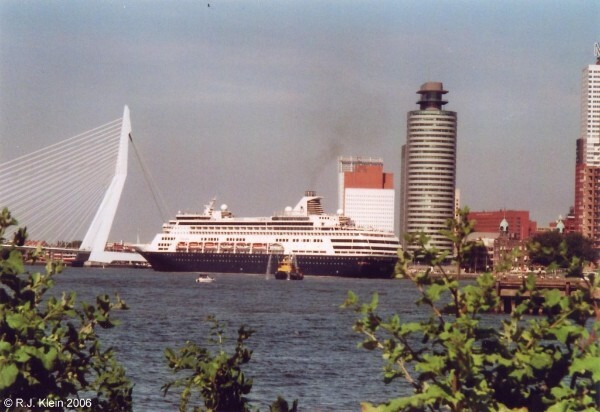 In 1995, for the first time in decades, the HAL visited Rotterdam again with Maasdam and this was becoming her homeport just one year later. All HAL-ships but Veendam were reflagged that year to the red, white and blue of Holland and with all new ships also under the Dutch flag, Carnival made it possible for the Dutch people to be proud of a fleet of great passengerliners under our own flag. It is not the same company, but their history is still vividly alive. Maasdam was updated in 2006 after a drydock at Freeport at the Bahamas. In this update, the ship recieved several new dining venues as well as a culinary arts center. Also, her cabins were refurbished and brought in line with the needs of modern humanity with flatscreens and DVD players. Then in 2011, another update followed in the SOEP (Signature Of Excellence Program) bringing her even more in line with the companies newest ships.